Next round ends on 31st January 2016. Dear clients, we are happy to announce that we rewarded our top 10 highest volume traders. The total amount for March’s giveaway is 844,82 USD. 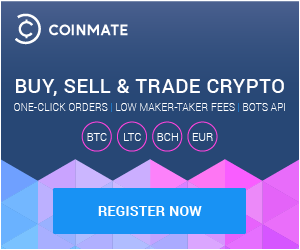 Coinmate.io is the first and only Bitcoin trading portal that provides a share of collected trading fees to its clients. The higher volumes we process the higher rewards we share. The first best trader received 20% share, 2nd 14% share, 3rd 10% and 4th-10th 8% each. Next round ends on 30.4.2015 and we expect even larger amounts. Qualify within the top 10 traders and get awesome rewards. Dear clients, we are happy to announce that we rewarded our top 10 highest volume traders. The total amount for February’s giveaway is 626.90 USD. Next round ends on 31.3.2015 and we expect even larger amounts. Qualify within the top 10 traders and get awesome rewards. Dear clients, we are happy to announce that we rewarded our top 10 highest volume traders. The total amount for January’s giveaway is 747.1 USD. Next round ends on 28.2.2015 and we expect even larger amounts. Qualify within the top 10 traders and get awesome rewards. On Monday 2nd February we will announce the top 10 traders. These traders will receive a portion of trading fees collected in the past month. The bonus will be credited directly into trading accounts and can be withdrawn in Bitcoin or to bank account without limitation. Stay tuned!